The Wells Fargo logo appears above a trading post at the New York Stock Exchange. 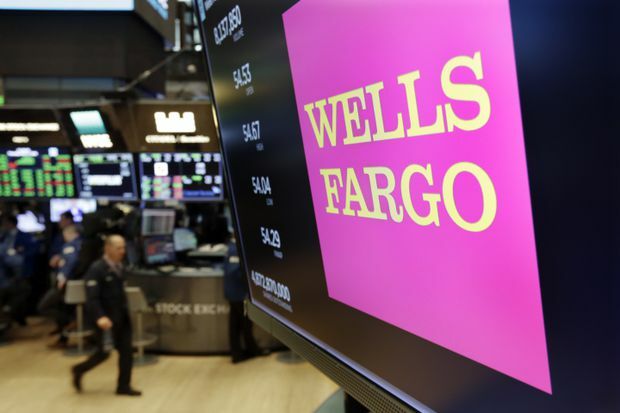 Wells Fargo & Co said on Friday its loan book shrank and it raked in less fee revenue than a year ago, factors that contributed to lower-than-expected quarterly profit and sent its shares lower. The total average loan balance for the bank shrank 1 per cent in the quarter from a year earlier as its consumer loan book fell by 2 per cent and commercial real estate lending slowed. “As it relates to underwriting standards, it’s not all bank-to-bank competition … the competition here is just broad as it’s ever been,” Chief Financial Officer John Shrewsberry told analysts, pointing to real estate investment trusts, sovereign wealth funds and other capital sources. Wells Fargo shares were down 0.9 per cent in afternoon trading. The bank’s mortgage business weighed on the income it makes from fees, which fell 8 per cent in the quarter to $9 billion. Intensifying price competition for mortgages hurt margins and borrower prepayments cut into servicing fees. The bank also said a program that helps customers avoid overdraft charges dented fee income. Even with loan balances falling, the bank’s net interest income rose 1 per cent, helped by higher interest rates. JPMorgan Chase & Co said on Friday its average core loans rose 7 per cent from a year ago. Total noninterest expenses rose 3 per cent to $14 billion, with the bank noting that marketing costs from a rebranding effort to help repair damage to its reputation added to costs.